Ableton finally launched The Bridge but also took us by surprise with Amp for Live. It's a guitar amp sim with modelling technology from Swedish DSP boffins Softube. The official demo video is notable for its distinct lack of blues-rock gurning and heavy metal heroics - what a letdown! Compact keyboards seem to be all the rage, and this week we've taken delivery of some of the latest efforts. 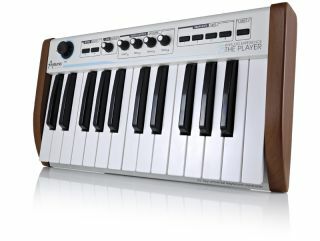 There's Arturia's The Player, which is impressively robust (and rather heavy); Korg's microKEY, being a lightweight portable device with two USB ports for plugging in more gear; and Akai's novel iPhone-ready SynthStation 25. ESI also released the Keycontrol 25 XT, but we haven't got one yet. Elsewhere, digital DJs could drool over Faderfox's titanic 4midiloop. Steinberg released WaveLab 7, finally making this splendid audio editor Mac-compatible too. And Novation released the UltraNova, an impressively spec'ed synth - disappointingly, however, it's one of those despicable hardware contraptions that only the likes of our sister magazine Future Music could appreciate! We're holding out for a plug-in equivalent, a la V-Station and Bass Station. How about it, Novation? Finally, check out this video of the amazin' Photosounder, demonstrating a new technique that the developer calls "melody flattening". This is some far out stuff, to be sure!